So haven’t had this problem before, but since a few articles, chats, videos, pics, etc have been coming out post Wildflower, I decided to make a “News” page. There is a significant chance this page will hit a massive lull after Widflower, but I’ll update it whenever new stuff gets thrown my way. If you find a cool (or crappy) article or picture or whatever that isn’t on here, let me know and I’ll post it. Thanks! Ok, huge dump of stuff here from over the last couple of weeks. Lava Magazine – One Triathlete, 10 Questions with Jesse Thomas – talks about a bunch of stuff, my dream triathlon, my broken neck, my hairy chest, etc, etc. Holy Crap! 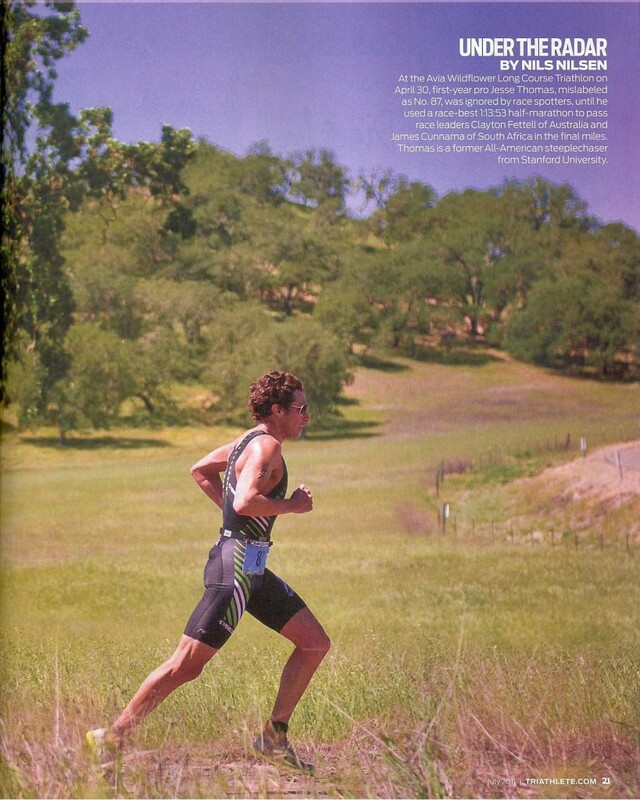 Triathlete Magazine has a two page spread of me at Wildflower. In their swimsuit edition nonetheless. Booyah! Thanks to Kelly Chrisman for the image. Feature from the Lundquist College of Business at the University of Oregon (My MBA program) – Athlete/Entrepreneur’s Big Win – talks about Picky Bars, how Lauren has helped me, etc. Good stuff. Shout out to Nate Kalaf for doing the filming/production. Nice work Nate! Post Wildflower interview with Slowtwitch.com – talks a bit more about the details around the race, Matt Lieto’s Clause “C”, my need for some sponsors, etc. Wildflower video posted by TriCenter, pretty funny, with “Who is that guy?” and “Clause C” of my contract with Matt Lieto. Thanks to Jim McDannald at Track Geek for finding this video of my post race interview with Tri California. It’s long, but has some fun details about the race, my borrowed bike, and Walgreens Aviators. Thanks to Mackenzie Madison for capturing this video of the announcer recounting the race and my interview during the awards ceremony. Congratulations on your fantastic achievement at IM Wales 2015. With your Welsh surname it seems fitting that you should achieve Ironman success in Tenby. And thanks for the kind description of the course – I think it is an awesome course (if a little bit mad) – its broken me a couple of times. So llongyfarchiadau (congratulations) on your fantastic success.